Working together to engage, challenge and inspire every student every day. For School Board meeting agendas, minutes and notices, visit the Board of Education Meeting Information page of our website. Join our community email list to receive Board Updates, our monthly newsletter and more! Subscribe now! The 2019-2020 Student Calendar is now available. Chief Business & Finance Officer Andrew Chromy testified at the Wisconsin State Legislature's Joint Committee on Finance public hearing on the Governor's 2019-21 Biennial Budget. Official Spring Election results for the Oak Creek-Franklin Joint School District School Board. 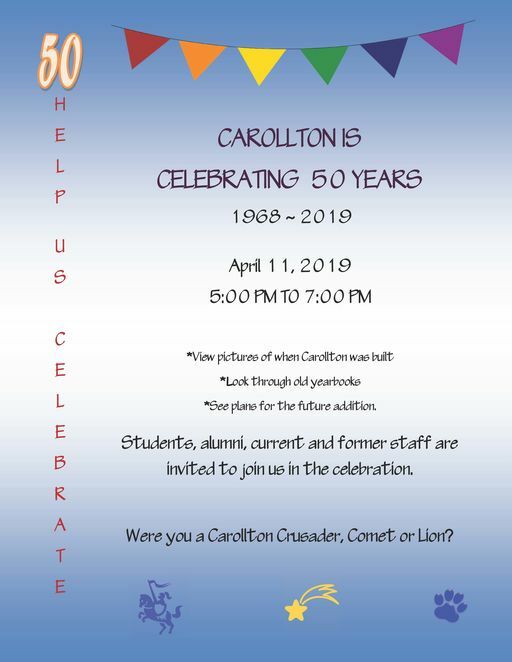 Carollton Elementary celebrates 50 years!